During the 2014-2015 school year students at West Marin school learned how people and trees are alike. 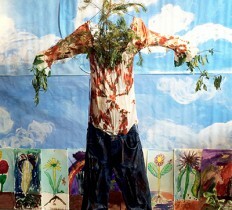 The installation at Toby’s gallery featured some colorful Tree People and an awesome painting of a giant Redwood tree. Self-Portraits from Vickisa’s annual Frida Kahlo art class were also featured.